At first glance, SEMrush might just seem to be an SEO and PPC tool, but it’s much more than just that with SEMrush you can assistance and guidance with a wide variety of tasks. Collecting in-depth data, brand monitoring, SEO research, performance tracking and much more can all be accomplished with SEMrush. In short, it’s a very in-depth and useful search engine marketing tool, but leaving it at just that would be a disservice to the benefits that SEMrush provides. When you’re facing tough competition SEMrush can really give you an advantage and can help you uncover new data that you wouldn’t have found otherwise. Outranking the competition may still be difficult but by using SEMrush you’ll be able to build a better more effective strategy and with time and work, you could easily outdo your competitors. It seems too good to be true, doesn’t it? But SEMrush is an SEO and marketing tool that really can do all that and much more. Its user interface is simple and straightforward and the program is very easy to get to grips with. But if you’re not convinced just yet let’s take a more in-depth look at some of the ways SEMrush can help you crush your competitors. SEMrush can give you the insider knowledge on your competitors and it’s not just a way for you to find the top keywords your competitors are using. SEMrush offers a wide variety of analytic tools that can help with SEO and much more. You can find the rankings of keywords, can get estimates for the traffic the keywords are attracting and even get estimates for the advertising revenue the keywords would bring. You can also get estimates for your competitors average traffic, keyword trends and even the density of advertisers. And don’t worry you don’t have to set-up any in-depth technical campaigns or spreadsheets to find the information you need. With SEMrush all you need to do is type in the domain of the site youwant to analyse, it’s that simple and easy. Thanks to the friendly user interface you can instantly keep tabs on your competitor’s performance and this can give you a wide range of benefits. Those great analytic tools aren’t just for analysing your competitors, they can be used for your very own keywords as well. You get real-time reports with SEMrush so you can see how your keywords are performing and instantly compare them with your competitors. A quality SEO keyword strategy is invaluable when it comes to attracting traffic to your site and with SEMrush you can keep tabs on your SEO performance to see exactly how it’s working. So if things are going wrong you’ll be able to notice right away and know when to make changes. Do you ever look through pages on your website and wonder how things could be improved? If so you’re not alone but knowing exactly how to improve the SEO on each page can be tricky after all there are only so many options isn’t there? But SEMrush will actually help by suggesting SEO improvements to you. When SEMrush analyses your website it will come up with ideas for how each individual page can be improved, just click on the ideas tab to bring up a list of options for how you can enhance your SEO. SEMrush can help in a variety of ways and can even suggest backlinks to sites that could help improve your rankings as well. You Can Find Out What People Think Of Your Brand! SEMrush includes a powerful branding tool that will help you find out exactly what people think of your brand and where it’s being talked about. In this increasingly digitally focused world, we live in knowing where your brand is being talked about and what is being said is incredibly important. SEMrush’s brand monitoring tool doesn’t just help you find out where and what people are saying about your business though it also identifies any backlinks to your site. This can actually help you find new opportunities for networking and advertising. Keywords are essential if you want to rise high in the rankings, but let’s be honest always knowing which keywords to use is tricky. If you want effective SEO but high-quality content then you can’t just bombard your text with keywords. But with SEMrush you can find alternative keywords so you can build an effective SEO strategy, ensure you land high in the rankings and have more varied and interesting content. With SEMrush you can discover new keywords you might never have thought of and really make your content stand out from your competitors. SEMrush will give your site a thorough audit in minutes and will list all the ways your site could be improved. It breaks down your results in an easy simple to understand form and lists which pages it identifies as healthy and which could be reworked. The audit is simple and straightforward but gives you a good starting place to work from. 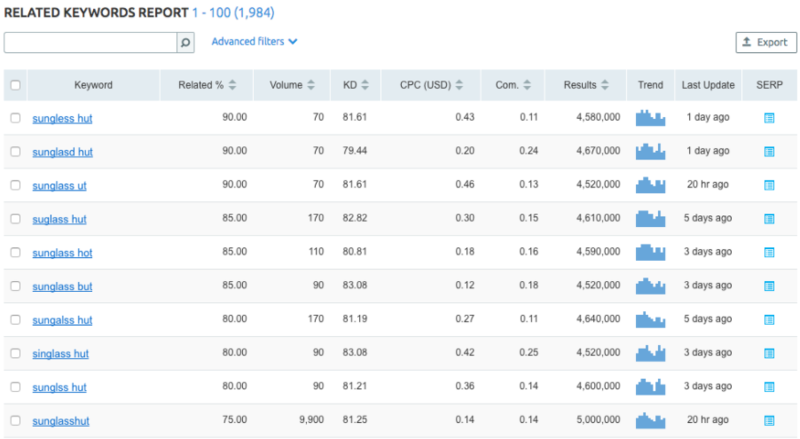 By using SEMrush’s auditing tool you’ll be able to find out exactly which areas of your site you should focus on and find out which areas are the most successful. This will give you a step up on your competition because you’ll be able to quickly identify which areas of you site will need more work and from there you’ll be able to focus your time and efforts on the improvements that need making, With SEMrush’s auditing tools you can build much more accurate and in-depth strategies for your website. SEMrush Gives Your Everything You Need In One Smart Package! SEMrush really gives you everything you need to get the edge of your competitors and ensure you have effective and high-quality SEO. That in itself is impressive but SEMrush can also help you discover new SEO keywords, trends and ways to build your businesses brand and that’s just the beginning. With SEMrush you can build quality backlinks, find new keywords, scout your competitors, audit your site and so much more. It’s a search engine marketing tool that as everything you need and you can do it all from a single dashboard. By using SEMrush you won’t just match your competitors but crush them!